Just a couple of loosely-related things that were interesting in Taiwan. A bi-monthly lottery encourages people to ask for their sales receipt (and thus pay sales tax). All sales receipts are printed/embossed with a number and an official seal. Like most lotteries here, there’s a grand prize for matching all numbers and lesser prizes for partial matches. Originally posted on flickr by shimmertje. They recently rolled out an economic stimulus program intended to get people shopping. 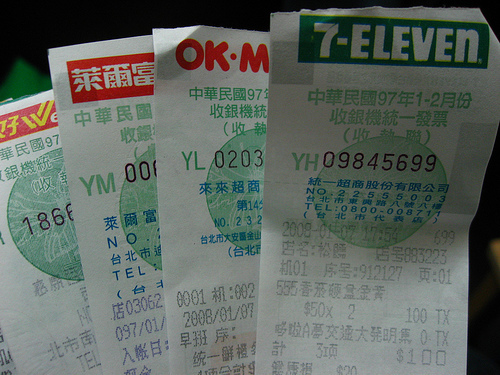 People were issued vouchers that could only be used for purchases (no saving!) and excluded certain items like alcohol and cigarettes. The expiration date on the vouchers ensure that the stimulus is fully injected into the economy by a certain date. It’s not cheap; each voucher has the security and anti-counterfeiting features of money.